The global population age 60 or over is growing faster than all younger age groups and faces the tide of chronic diseases threatening their quality of life and posing challenges to healthcare and economic systems. To better understand the underlying biology behind healthspan—the healthy period of life before the first chronic disease manifestation—scientists from Gero and MIPT collaborated with researchers from PolyOmica, the University of Edinburgh and other institutions to analyze genetic data and medical histories of over 300,000 people aged 37 to 73 made available by UK Biobank. "According to Gompertz mortality law, the risk of death from all causes increases exponentially after the age of 40 and doubles approximately every 8 years", explains Peter Fedichev, founder and CSO of Gero. 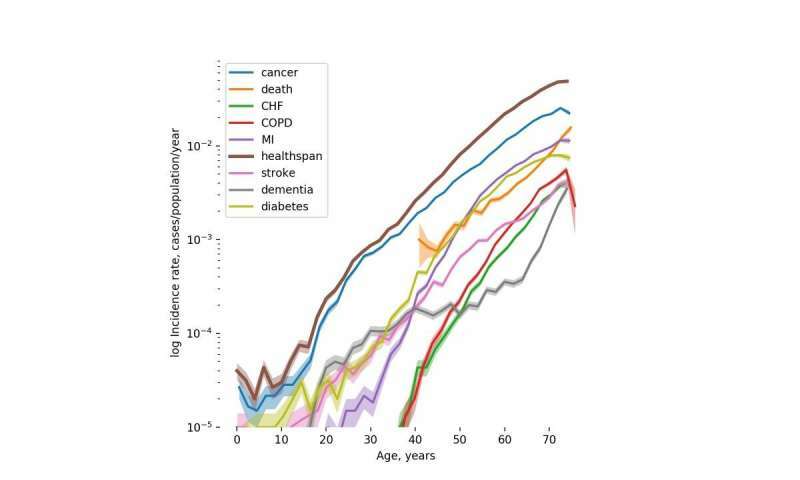 "By analyzing the dynamics of disease incidence in the clinical data available from UKB, we observed that the risks of age-related diseases grow exponentially with age and double at a rate compatible with the Gompertz mortality law. This close relation between the most prevalent chronic diseases and mortality suggests that their risks could be driven by the same process, that is, aging. This is why healthspan can be used as a natural proxy for investigation of the genetic factors controlling the rate of aging, the 'holy grail' target for anti-aging interventions". To understand genetic factors associated with human healthspan, the researchers studied the genomes of 300,477 British individuals. Overall, 12 genetic loci affecting healthy life expectancy were discovered. To confirm that these results hold true for other ethnicities, they used genetic data of UK Biobank participants with self-reported European, African, South Asian, Chinese and Caribbean ancestry. Of the 12 SNPs, 11 increased risk both in discovery and in replication groups. Three of the genes affecting healthspan, HLA-DBQ, LPA, and CDKN2B, were previously associated with parental longevity, a proxy for overall life expectancy. The studies of longevity genetics are complicated due to the limited availability of datasets containing clinical data of genotyped individuals who already reached the end of lifespan. Healthspan as a target phenotype offers a promising new way to interrogate the genetics of human longevity by tapping the research potential of large cohorts of living individuals with rich clinical information, such as UK Biobank. "The inevitable aging of the global population calls for longevity research to focus on understanding the pathways controlling healthspan. Our study highlights the potential of GWAS methodology to delineate genetic architectures of healthspan and lifespan. We hope that our work will eventually help to produce novel diagnostic tools in the field of genetics of aging, and to shape the target space for future therapeutics against aging. At the end of the day, healthspan, not lifespan, is the ultimate goal of future life-extending interventions", concludes Peter Fedichev, founder and Chief Scientific Officer of Gero. Is there SOMETHING I AM MISSING???? Of course there is a link. BUT IT IS PROBABLY THE LINK BETWEEN A REDUCTION OF TELOMERE LENGTH WITH AGE !!! How is this factor ignored in this research? ?